Where can you find comprehensive diesel repair in Rohnert Park? RPM Automotive Services is staffed by diesel specialists that offer a full-range of services including tune ups, scheduled maintenance, and repairs. Our family owned and operated business has been a staple of high-quality automotive repairs in the North Bay for over thirty years. You can rely on our facility for highly trained auto technicians, quality work, and responsive customer service. Our experienced technicians are diesel specialists that can handle any maintenance or repairs your vehicle needs. Our ASE Certified technicians receive continuous training to stay on top of the technological changes to the auto industry. 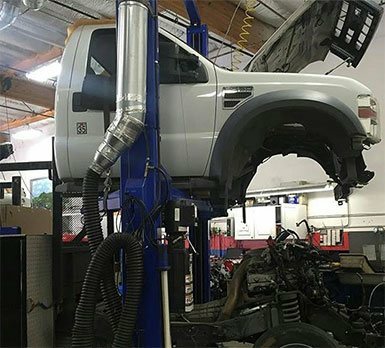 We’ve made ourselves experts in Ford PowerStroke diesel repair and Duramax service. You can rely on us for skilled treatment of your vehicle; we don’t go into diesel service thinking it’s like a spark-ignition engine. Our years of experience on different types of vehicles and focus on continued learning allow us to offer expert diesel repair from our Rohnert Park facility. We also have an in-house automotive machine and engine shop allows us to complete complex repairs on all types of vehicles, from Japanese imports to domestic trucks. We serve personal vehicles, fleets, and trucks and equipment up to 2 ½ tons. We have a full-service welding repair and fabrication facility that allows us to control meticulous repairs from start to finish. You can count on repair reminders (via snail mail, email, or text), computerized tracking of all vehicles, and Carfax reporting for all of the repairs we perform on your vehicle. Have questions? Please ask! We’re happy to explain any repairs or maintenance your vehicle needs. When you need diesel repair in Rohnert Park, head to the experts at RPM Automotive Services. We look forward to getting you back on the road in a smoothly running vehicle!